I am about a stone and a half too heavy at the moment – I am 5ft 6 inches tall and currently weight 11 stone 5lbs. I had gained some weight last year but was hoping the marathon training I was doing would help this. It didn’t, as I ate too much of everything thinking it would be ‘ok’ doing the extra miles! So nearly a year on I’m heavier than ever and my fitness isn’t great. So I’m looking for some advice on how to lose the excess weight whilst upping my training but without feeling ‘run down’. Each time I reduce my food intake and up my exercise it ends with me having a sore throat and usually a cold and I’m back to square one. Any advice on calories/nutrition balance with exercise to see a consistent weight loss and feeling fitter? Thanks Julie. Losing weight takes patience and the recommendation is 2lb per week, however following the dietary advice below and continuing with your training may result in a greater weight loss. Keeping a food diary of your own will give you more of an insight into your eating habits and could be an eye opener! It is important to eat adequate calories to meet the requirements of your training in particular the days when you are running a longer distance, this will ensure that you have the energy for your next bout of exercise and that you are also getting a balance of nutrients including; vitamins and minerals (from fruit & vegetables) to prevent catching further colds etc. However, it is essential for the days when you are resting or participating in shorter easier runs to consume a lower amount of calories. Portion control is essential to assist with weight loss and weight management for example; half a mug of cooked pasta or ¼ of a mug of cooked rice counts as one portion. A portion of fish, chicken, turkey should fit on your palm. Carbohydrate is the most efficient nutrient that the body uses for energy but go for the wholegrain variety as the high fibre content will keep you feeling full for longer and reduce the likelihood of overindulging on cakes, biscuits and sweets. 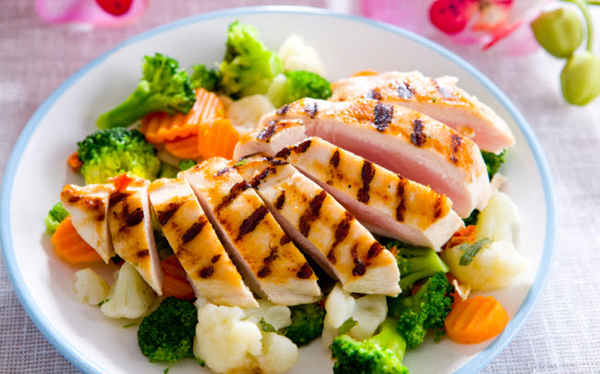 It is important to include protein with each meal such as; fish, chicken, lean mince, turkey, eggs and nuts. If you are an early bird and are happy to train early in the morning (for shorter runs eg 25 minutes-30 minutes), run on empty stomach, then have a high protein breakfast such as; scrambled eggs or an 2 egg omelette with a sprinkle of low fat cheese or natural yoghurt (Total 0% yoghurt is high in protein and has a very low carbohydrate content compared to many other natural yoghurts), add a handful of almonds, cashew nuts or walnuts and a tablespoon of pumpkin seeds. This approach will ‘force’ the body to use fat for energy rather than carbohydrate and aid weight loss. However, if you are diabetic it is vital to have some sugar with your breakfast. Avoid eating late at night as your metabolism slows down and excess calories over a period of time will be stored as body fat. If you need to eat after an evening meal, consume a piece of fruit (low in calories) or a handful of almonds, brazil nuts (6 approximately), providing you do not have a nut allergy. Ensure that you are drinking sufficient water, at least 2 litres per daily to hydrate even when the weather is cold, the body will still sweat and needs water to replace the fluid loss during exercise. Water will also fill you up. If you have a question that you would like to put to our panel of experts then please click here.